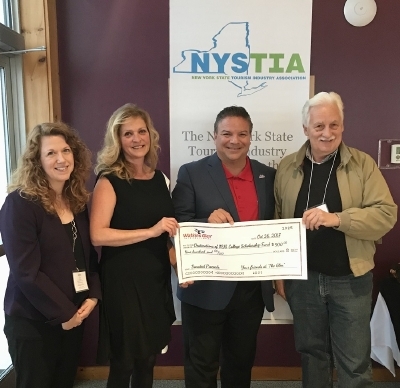 Watkins Glen, NY – Watkins Glen International, North America's premier racing facility located in the beautiful Finger Lakes region, has donated $1,450 to the Destinations of NYS Travel, Tourism, Hospitality & Culinary College Scholarship Fund. The scholarship fund is managed by the New York State Tourism Industry Association (NYSTIA). The monies were raised this past fall, when the facility hosted NYSTIA's annual Tourism Excellence Awards reception and dinner. Guests were given the opportunity to pay an additional fee to take a thrilling ride in an official pace car around the track. During the reception, Michael Printup, President of Watkins Glen International, made the announcement that the fees, designated to cover the costs to operate the pace cars, would instead be donated to the scholarship fund. Pre-event, pace car ride reservations had tallied $900. Following Mr. Printup's announcement of the donation, on-site sales soared another $550, with some attendees opting to take an additional ride for fun and a good cause. In 2017, the scholarship fund awarded four $1,500 scholarships to college students from across New York State, following a vetting of applications by the NYSTIA scholarship committee. The 2018 application process is now open through February 28th. Recipients will be announced at the “I Love New York” Empire State Tourism Conference in Schenectady, NY on April 24, 2018. Scholarship applicants must be New York residents enrolled in a NYS-based college or university, pursuing a degree program related to travel, tourism, hospitality, or culinary arts. More details and an application are online at www.EmpireStateTourism.com, or contact info@nystia.org for assistance. History: For 27 years, a college scholarship program was administered by Destinations of New York State (DONYS) a tourism marketing company founded in 1979 that actively markets and promotes tourism throughout New York State. In 2015, the scholarship program was transferred to NYSTIA for administration, fundraising and disbursement. To honor DONYS founders Charley Daley and the late David Thornton for their service to the tourism industry and this important program, NYSTIA re-branded it as the Destinations of NYS Travel, Tourism, Hospitality & Culinary College Scholarship Fund. Watkins Glen International (www.theglen.com) was established on the streets of Watkins Glen, NY in 1948 and is North America's premier racing facility. The Glen has a long and storied past from its Formula 1 roots to its position as New York's home for NASCAR.